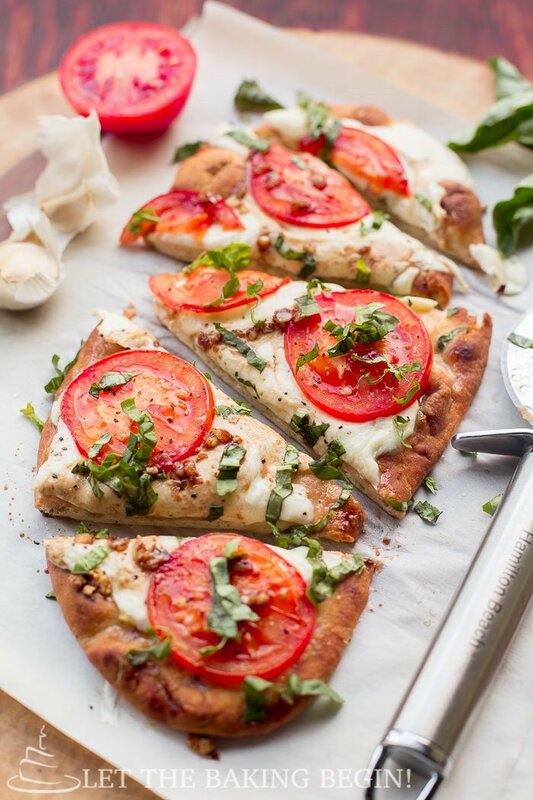 15 Minute Margherita Flatbread Pizza – delicious, easy recipe for a homemade pizza made with Naan Bread, Fresh Mozzarella, Tomatoes, Garlic and Basil that’s great for busy weeknight dinners or parties. The other day my parents were visiting and my mom among other things brought me a bag of naan bread. It’s delicious to eat just toasted, but next day come lunch time I decided to use it as the base for a flatbread pizza. When time (or willingness) allows I like to make my own crust, but having a pre-made crust that can be loaded with pretty much anything is pretty awesome if you ask me. The whole process from start to finish doesn’t take more than 15 minutes, and tell me that having a lunch like this ready in 15 minutes is not awesome! This idea of using fresh Mozzarella, tomatoes & basil is totally inspired by this recipe from NatashasKitchen.com. After eating those canapés at my girlfriends’ get together I might or might’ve not have made them 5 times. After the first time I tried it, I felt like the canapés would benefit from a good kick of garlic, so I have made them with garlic each time. 4. Meanwhile mix the remaining oil & garlic with the balsamic vinegar, stirring until a smooth emulsion forms. 6. Once flatbread pizza is baked and the edges are golden in color, remove from the oven, drizzle with however much of the balsamic vinegar mixture you would like, sprinkle with basil leaves, slice , serve and enjoy! Just saw this recipe, it looks amazing! Very good and easy. I added some pizza sauce and more Italian seasoning. I love pizza, I try your pizza at home. I like it most, thanks for sharing such a great recipe with us. I don’t like Balsamic Oil I substituted it with Basil Infused Oil..it was terrific. My husband requests this weekly! Thanks for the yummy recipe. I usually pat the tomatoes and mozzarella dry before sticking them on the naan bread because if not it typically makes the bread soggy and leaves little pools of liquid.. but maybe thats just me 😉 tastes delicious though. This has become a staple for me – so easy and delicious! Thank you for sharing. I don’t usually leave comments but I just wanted to say this is really easy, healthy, and delicious recipe. Our family ate this for dinner and we fell in love! Thank you. God Bless. 1. What size naan do you use? 2. What about another type of crust, such as a lavish, or flatbread? This is an excellent recipe. The balsamic vinegar really adds something special! I prefer this recipe to most restaurant margherita pizzas I’ve tried! Thanks so much for posting it! This is so good! I made it with a zucchini crust recipe that I have and my husband loves it! We’re having it for the third time tonight! I love this recipe, but I can never get the crust crispy. It is always soft. Try mixing just the oil and garlic, without the vinegar, and crisp it up in the oven. Then add the vinegar last when you take it out of the oven with the tomatoes and the cheese. Hope this helps! Can I use shredded mozarella and whole wheat pizza dough? I have all of the ingredients in the house and don’t feel like running to the grocery store for one thing! When I was buying the naan, n, I swung by the by the salad bar and grabbed some grilled chicken. It isn’t even that expensive as compared to when you top it on your salad. Four bucks got me plenty of chicken to put on top. This looks delicious and super easy! My question is (newbie to cooking here) What do you put the pizza on the two times you put it in the oven? A baking pan? nothing? I don’t want to mess up the integrity of the pizza crust. Thanks for your question! you put it on a baking sheet. Or if you don’t have one, just put some foil underneath. want to try this recipe. can u use a light layer of tomato sauce or pesto as a base? Yes you can use both of those, although if you do use the tomato sauce you might want to put less tomatoes on top. what kind of mozzarella do you recommend? this looks so easy and great, I plan to try it this Friday as a nice quick appetizer before a night out with my girlfriends! P.S. You might want to replace the fresh garlic with powdered garlic (about 1/2 – 1 tsp) if you guys are going to go out after eating this lovely flatbread 😀 . this is the best review ever!! Thanks so much for posting it! You can either post it on my wall on Facebook or if you have instagram you can hashtag it with #letthebakingbeginblog and I will be able to see it. IF you have a service that you can upload your picture too, you can then include it here in the comment section by clicking on the “img” above the comment section to insert the link with description. I made this for dinner on a Monday night when I was tired & hungry … turned out to be a easy, and a huge success! I substituted roasted red peppers for the tomatoes, I love how simple this recipe is! I love the idea of this recipe. Beautiful photos. Wow! This looks phenomenal. I love all these ingredients. Love your pictures, as always. Pinning! Try it with no chicken first. This combination is really perfect and doesn’t need anything else. I never thought it would be as good as it was when I tried it. I shared it with my sisters family and her husband made a personal call to me to tell me how much he didn’t expect to, but loved it! LOVE this pizza! So fresh and beautiful. I love using naan bread as pizza bases. Interestingly enough, I find they actually taste a lot like authentic Italian pizza crust and like you said so quick!! Can you substitute the mozzarella cheese into cottage cheese? They’re not similar in texture or flavor, so if you did it wouldn’t taste like it was intended to. So I guess you can put anything you want on it, but it wouldn’t taste the same. Here you’ll find beautiful European Cakes and Desserts as well as other savory dishes my Ukrainian family enjoys.